From Ben Nevis to Beinn Teallach the Munro Mountain Chart shows the locations of all 282 Munros and includes a complete Munro tick-list to record your progress. Each mountain is drawn to scale and is clearly named and numbered in altitude order. 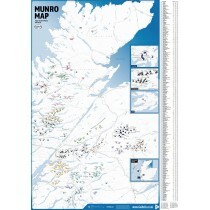 The chart is both a functional and informative piece of artwork for the home and the perfect poster for any Munro bagger.